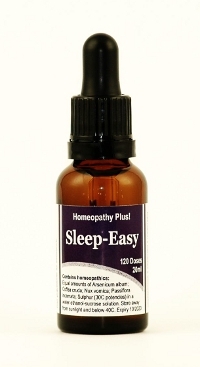 Contains remedies commonly used to reduce the symptoms of sleeplessness or frequent waking. Shake the bottle. Place approximately 5 drops in the mouth. Take a dose once a day until sleep improves, and then dose only as needed. If there is no change at all by 4 doses, stop and contact your practitioner for assistance. Equal amounts of Arsenicum album; Coffea cruda; Nux vomica; Passiflora incarnata; Sulphur (30C potencies) in a water-ethanol-sucrose solution. Each bottle contains 120 doses. Store away from sunlight and below 40C. Expiry 10/2020.